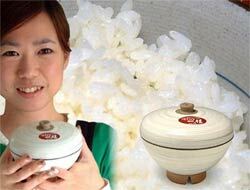 College students and lonely singles who enjoy rice, but don't want to make a whole bunch can use this Micro Rice Cooker from Japan to make rice for one. The rice washing is still necessary, but this allows you to use the microwave instead of a rice cooker, and comes in a small bowl—perfect for one. This takes 15 minutes to heat up in the microwave and out comes a bowl of rice. We suppose you could just use a regular rice cooker and put in a tiny bit of rice for the same results, but this seems more gadgety. Available now for $44.